Drupal announced on October 15th they had a critical pre-auth SQL Injection (SQLi) vulnerability – here. There is a pretty good write-up of the vulnerability here. This post will demonstrate another use case for Python by building up a script to exploit the SQLi flaw to add an administrative user. The script simply prompts the user for a username to append to the SQLi payload with a static password string of “password”. if len(sys.argv) != 2: # Checks to make sure that a URL was supplied as a sys argument "[script] [URL]"
print "[+] Attempting CVE-2014-3704 Drupal 7.x SQLi"
print "Account created with user: "+user+" and password: password"
Interested in learning more about Python for Security Professionals? 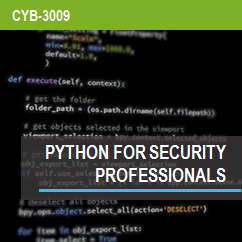 Start Cybrary’s FREE Python for Security Professionals Course Today! Primal Security is a blog and podcast dedicated to sharing knowledge within the information security community. Learn more about the Primal Security Team.